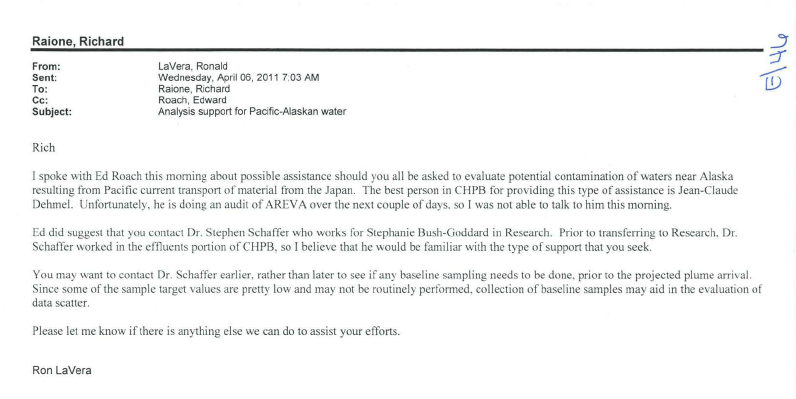 I spoke with Ed Roach this morning about possible assistance should you all be asked to evaluate potential contamination of waters near Alaska resulting from Pacific current transport of material from the Japan. The best person in CHPB for providing this type of assistance is Jean-Claude Dehmel. Unfortunately, he is doing an audit of AREVA over the next couple of days. so I was not able to talk to him this morning. Ed did suggest that you contact Dr. Stephen Schaffer who works for Stephanie Bush-Goddard in Research. Prior to transferring to Research. Dr. Schaffer worked in the effluents portion of CHPB, so I believe that he would be familiar with the type of support that you seek. You may want to contact Dr. Schaffer earlier, rather than later to see if any baseline sampling needs to be done, prior to the projected plume arrival. Since some of the sample target values are pretty low and may not be routinely performed, collection of baseline samples may aid in the evaluation of data scatter. Please let me know if there is anything else we can do to assist your efforts.